This time of year, a strange little ritual takes place in my kitchen almost every evening. It goes something like this: I haul everything from my most recent greenmarket visit out of the fridge and dump it onto the counter. Then I stand there, contemplating the miscellany and considering what’s most likely to wilt in the next day or so. I cram the rest of my stash back into the fridge and then I stand there a little longer, hesitating, mulling over what exactly to fashion from the ingredients. Then I inevitably revert to my standard summer supper, which means rinsing the items, tossing them on the cutting board, giving them a rough chop, and, more nights than not, dousing them with an immodest glug of glistening olive oil and a smattering of coarse sea salt. No cookbook. No recipe. No stovetop. Nothing else save for a fork or, on exceptionally indelicate evenings, fingertips wiped on a flour sack towel. But I think I tend to take the notion somewhat more literally than my old boss—and, maybe, many home cooks. I worship at the altar of the Union Square greenmarket. I’m flat out mesmerized by the crinkly, paper-thin rainbow Swiss chard leaves and their skinny stems as pliable and psychedelic as those bendy colored plastic drinking straws from my younger years. 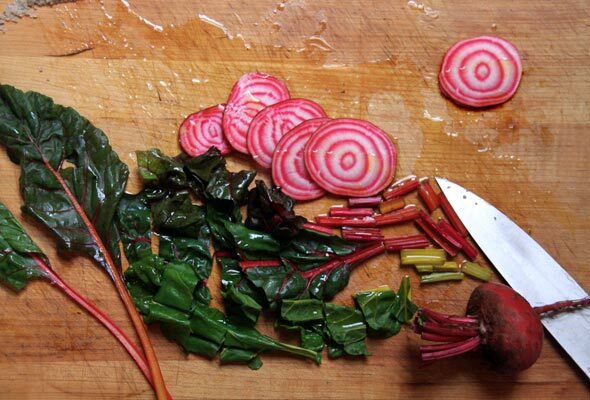 I’m smitten with chioggia beets, their tie-dyed halos, and their taste that’s far less earthy than you’d expect. And so on and so forth. The corn on the cob that almost approximates the sweet corn of my Iowa childhood. The tart Carolina cherry tomatoes in pale yellow. The luscious Sun Golds from the hippy biodynamic farm stand. The mache and baby tat soi and mizuna and other little leafy green things I can’t always identify from Windfall Farms. The nutty minutina and the delicate, vibrant, sweetly spicy nasturtiums from Two Guys from Woodbridge. There’s no real agenda driving my supper strategy. I’m not a vegetarian. Or a vegan. Or a raw foodista. I just happen to like simple things done well. And it doesn’t get much simpler than the innate goodness of these ingredients. I initially intended this nonchalant approach to dinner as an occasional indulgence, reserved for weeknights after a market run when everything is go-weak-in-the-knees fresh and my schedule is go-weary-in-the-head crazy. Although somehow it’s become an almost nightly observance. I just lose myself in the colors and textures on the cutting board. Chioggias and chard. Microgreens and cilantro. Corn off the cob and cherry tomatoes with Thai basil and mint. Some may construe this way of assembling supper as underwhelming, unsophisticated, even an act of quiet and misguided defiance against a culture that demands a dozen or more flavors of Doritos. I’m okay with that. To me, it’s a means of reveling in summer’s extravagance. It’s sort of how I consider makeup during warm weather. Why bother with anything beyond a little mascara and a smudge of lip stain over a tan? There’s a frank earthiness about both. A willing embrace of what is. So call me a simpleton. It’s not for long, this simple summer supper. Still, E won’t get his countertop back anytime soon. Come late season, as I mourn the loss of these ingredients, the pile-it-on-the-cutting-board approach will be replaced by its not too distant kin, the cook-it-all-in-one-skillet technique, dubbed greenmarket hash by one of my girlfriends. A recipe for another day, perhaps. Photo © 2010 E Rossi. All rights reserved. All recipes and photos used with permission of the publisher.